Summary Redesigned all QCA 4x4 router with Gigabit Ethernet ports, USB 3.0 and eSATA storage and printer sharing and working MU-MIMO. It's been just over a year since we reviewed NETGEAR's Nighthawk X4 AC2350 Smart WiFi Router. Like all other first generation 4X4 AC2350 / AC2400 class routers, the NETGEAR R7500 used Quantenna's QSR1000 5 GHz 4X4 "MU-MIMO ready" radio, which remains "ready". Firmware enabling MU-MIMO has yet to be publicly released for any Quantenna-based product. In the meantime, consumer router makers have moved on to produce a second round of 4x4 routers, using chipsets from Qualcomm Atheros (QCA) and more recently, Broadcom, now Avago. QCA-based products created the AC2600 class, using the same 4x4 QCA device for both 2.4 and 5 GHz. This bumps the 2.4 GHz maximum link rate to 800 Mbps, which added to the 1733 Mbps 5 GHz maximum equals 2533 Mbps total, which has been rounded to a nice, even 2600 Mbps. Although it supports MU-MIMO, the R7500v2 remains an AC2350 class router because it continues to support 600 Mbps on the 2.4 GHz band. As such, it is a bit of an oddball, being the only AC2350 class router with working MU-MIMO. NETGEAR doesn't make it easy to get your hands on a MU-MIMO version of the R7500. It doesn't have a separate SKU and v1's have not all "sold through" as this review is written. So if you buy online, you'll just have to see what you get. If you buy in a store, however, you'll need to look carefully at the shield-shaped badge on the box front. A helpful SNBForums member posted the image below, which has been enhanced to make it obvious what to look for, i.e. "Now with MU-MIMO". The R7500v2 catches up with the other routers - all of them AC2600 class - that have implemented MU-MIMO by using the second generation Qualcomm QCA9980 4-stream 802.11ac MU-MIMO radio on the 5 GHz band. 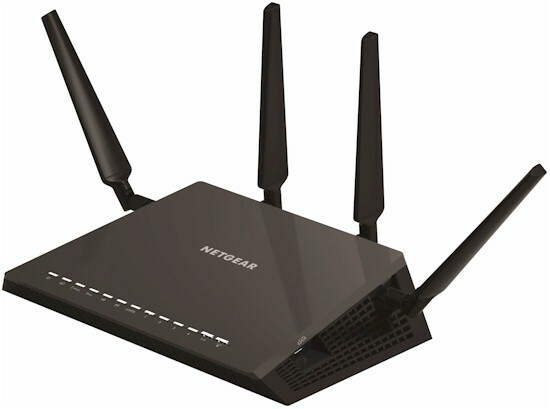 But NETGEAR chose to stay with the same QCA9880 3-stream 802.11ac radio used in the original R7500 on the 2.4 GHz side. While this gives the R7500v2 the marketing disadvantage of being a lower class number, it makes no practical difference vis-a-vis AC2600 class routers. The only difference between the two classes is the AC2600's 4x4 2.4 GHz radio. Since most devices connecting to routers are 1x1 or 2x2, they can't take advantage of one extra stream, let alone two, anyway. Here's what the top of the v2 board looks like. 5 GHz radio is at top left; 2.4 GHz bottom left. Note the fourth amplifier is not loaded on the 2.4 GHz radio. Here's the v1 board with Quantenna 5 GHz radio for comparison. Both photos have RF can tops removed. Thermal pads on the can tops connect to a large heatsink plate attached to the top cover on both versions. Here's the v2 bottom side with 128 MB of flash. Table 1 below summarizes the key components of the NETGEAR R7500v2 plus R7500v1, ASUS RT-AC87U and TP-LINK Archer C2600 I'll be using as comparison products later. NOTE: NETGEAR increased RAM capacity to 512 MB after FCC sample submission. The features of the NETGEAR R7500v2 are the same as the original R7500, so if you are interested, please refer to that review. There have been a few tweaks on the UI, so I've included a screenshot of the landing page from the R7500v2.